Usually, when a new rail line was built, the railway placed a temporary (sometimes a boxcar) or portable station at a location until it was determined what kind of station would be appropriate. Sometimes the 'temporary' station was in place for several years. The following are some of the 'permanent' stations built by the CPR in Central Alberta. In many cases, the 'permanent' station was replaced by a larger one if the railway or the community had special significance and usually they were 2 storeys. The Calgary & Edmonton Railway was constructed from Calgary to Red Deer in the fall of 1890 and continued on to Edmonton the following spring. Stations were primarily boxcars until, in 1891, the railway built a cookie-cutter combination station and freight house approximately every twenty miles along the route. Each was constructed in about three weeks. Besides Red Deer, this design was built south at Innisfail, Olds, Carstairs and Airdrie. North of Red Deer, they were built at Lacombe, Ponoka, Wetaskiwin, Leduc and Strathcona. 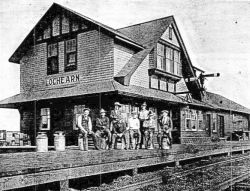 By 1914, the stations at Red Deer, Lacombe, Wetaskiwin and Strathcona were replaced by larger stations and the original stations were relocated and converted to freight sheds that were in use until the 1950s. 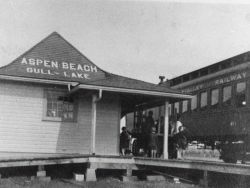 The stations at Ponoka, Innisfail and Olds remained as the principal station also until the 1950s. The Innisfail and Olds stations were replaced by unimaginative and utilitarian cinder block buildings. 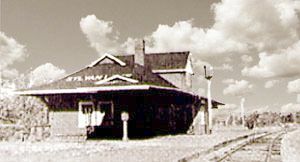 South of Calgary, similar stations were built at High River, Claresholm, Okotoks, Nanton, and De Winton. 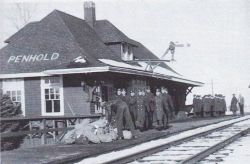 About 400 of these small stations were built in Western Canada and, in many communities, the 'portable' station was the only one they ever had. Some portables replaced even smaller temporary stations. Many portables were replaced by larger stations and were repurposed for a variety of uses including freight houses or bunk houses. Some portable stations were moved from place to place and occasionally replaced larger stations when they were no longer needed. Portables were used in many Central Alberta communities including Penhold, Bowden, Hobbema, Millet, Ellerslie, Nisku, Tees, Mintlaw, Cygnet, Sylvan Lake, Rocky Mountain House, Eckville, Bentley, Rimbey and Wimborne to name a few. The Calgary & Edmonton Railway, operated by the Canadian Pacific Railway, had stations approximately every 10 miles. The combination station and freight house described above were located about every 20 miles. The intermediate stations had portables until more substantial stations were constructed several years later. The following four stations along the line were the only ones of their type built in Alberta. 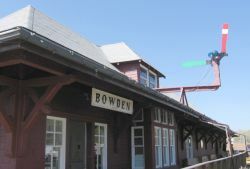 The Bowden station has survived but moved to Innisfail and the Penhold station has been replicated (with a lower roofline over the original freight shed portion). This station was typically 87'x24' including 40' freight house with waiting room, office and baggage/express, plus living room and kitchen on the main floor and 3 bedrooms upstairs for the station agent's family. In Saskatchewan, 16 of this type were built but only 1 in Manitoba. An exception to building the #2 stations at intermediate points along the Calgary & Edmonton Railway was the station at Didsbury. Typically, these stations were originally 32'x24' plus 30' freight shed, often with expanded freight shed (as was the case with Didsbury). Similar stations were built in Alberta at Bassano and Cochrane. A total of 4 were built in Alberta, 2 in Saskatchewan and 11 in Manitoba. This station was typically 73'x22' but varied in size. It usually had an express room and baggage room in addition to a large general waiting room, ladies waiting room, office and freight house (which in itself varied in size). The smallest version (#5) was typically 50'x22' with smaller waiting rooms and no express room. All had four rooms on the second floor for either the station agent's family or train crews. This type of station was usually built at junctions with other branches or railways, or where there was a need for crew changes. There were similar stations at Provost, Exshaw, Vulcan and double-gabled variants at Brooks and Taber. There is no indication that any of this station type survived in Central Alberta. However, the Bassano station (162'x20' including freight shed - one of the largest wooden stations still in existence in Western Canada) was sold by CPR in 2010 and was moved to the Beiseker Railway Museum in 2012. The Standard #5 was a variation and smaller version of the #10 and was much more common. They were generally built at small communities along branchlines. These stations are sometimes referred to as Standard #10 small. However, they often look larger when they have longer (sometimes much longer) freight sheds attached. They are recognized by narrower or fewer window treatments and a smaller second storey. Similar stations were built in Alberta at Irricana, Ervick, Acme, Daysland and several others. This station was typically 50'x22' and had a general waiting room, ladies waiting room, office and freight house (which in itself varied in size). It also usually had four small bedrooms on the second floor for the station agent's family. None of this station type is believed to have survived in Central Alberta. 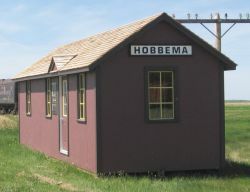 There is a surviving station of this type at Arborg, Manitoba. The #10 and #5 standard stations were among the most common station types built between 1905 and 1910. A total of 51 were built in Alberta, 81 in Saskatchewan and 10 in Manitoba. The Red Deer station was federally designated a protected historic site in 1990 (days before it was scheduled for demolition), a municipal historic site in 1991 and provincial historic resource in 1993: purchased and restored in 1996; renovated for use as commercial and office space; former CPR railyard redeveloped for commercial, residential and major roadway use. Similar stations (each architecturally unique but with octagonal towers) were built at Lethbridge in 1905, Medicine Hat in 1906, Strathcona in 1907 and Saskatoon in 1907. 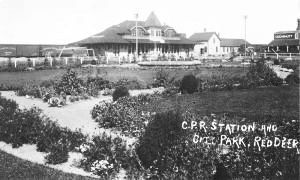 See Red Deer CPR 1910 Station page for more detailed information including renderings of all 4 views of the station. These were the only two of this type built in Alberta (although the Lacombe station (see below) was very similar in appearance). Six were built in Saskatchewan between 1908 and 1913 including the stations at Kerrobert, Wilkie and Outlook. The stations were typically 114'x26' with no agent accommodation or room for LCL (less than carload) in the station itself but did have an express room and baggage room. A separate freight house was usually attached. Typically 55'x24', a total of 57 of this type were built in Alberta, 121 in Saskatchewan and 19 in Manitoba, and were among the most common of stations. unique small one-storey station with wide roofline built 1917 by the Lacombe and Blindman Valley Electric Railway (renamed Lacombe & North Western Railway in 1918, acquired by CPR 1928 as the Hoadley subdivision). Mixed trains used the station until it was closed and sold in the 1950s, used as chicken coop for several years, donated to the Summer Village of Gull Lake in 1998 for use as a museum. Similar stations were built in Alberta at East Coulee and several others. A total of 32 of this type were built in Alberta, 31 in Saskatchewan and 5 in Manitoba. Typically, this one-storey 50'x17' #4A station contained a waiting room, office, express room, and freight room. A similar station was built at McLennan the same year and two others were built in 1942 at Breton and Pearce. Earlier versions, referred to as CPR Standard #4, were built in Saskatchewan and Manitoba.